My son picked up my copy of The Achilles Effect, by Crystal Smith, and started reading aloud about toy action figures that have bulked up to superhuman proportions. I hadn’t started reading it yet, so he regaled me with the discussion of one particular Wolverine action figure that, if he were an actual 5’10” man, would have biceps that measured 32 inches around – just one inch less than his waist. The author tells us that even wrestler Hulk Hogan, with the help of steroids, has biceps of only 25 inches. We laughed together over how difficult it would be just to move around with Wolverine’s gigantic arms. If you tried to lift your arms, “your shoulder would hit your neck,” he noted. And you wouldn’t fit through doorways. I’m glad that at age 15, he can laugh about the absurdness of images marketed to children. But at a younger age, children are not so able to critically analyze the messages around them. They just take them in, and those images become a part of their developing psyches as they seek to make sense of the world. 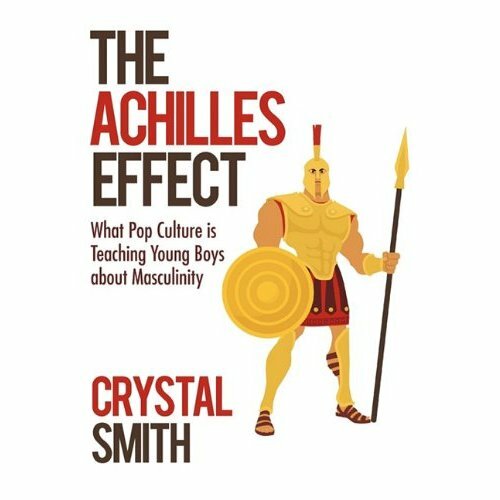 The Achilles Effect is full of many more specific examples of what young boys are taking in about masculinity in the cartoons, movies, book and toys they see daily. Ms. Smith has produced a well-researched and powerful resource that will alert the parents of young boys to the messages in specific popular current TV shows, movies, books: The messages that tell boys that to be a man requires toughness and aggression, all the time, and any show of vulnerability is too be avoided at all costs. The gender stereotypes that are so prevalent in the media set limits on young boys just as they are seeking to explore and discover who they are. I can’t represent this review as entirely impartial, since the author thanks me for my support in the preface. But the reason I support this book is because I believe parents need to be aware of the insidious and exploitative nature of the media today. There is so much in here that I have been thinking about since my boys were young. We are not all experts at decoding media. And I found that this is an accessible book that helps to alert parents to such issues, and the risks. It also provides lots of suggestions for positive books, television shows and movies for elementary school boys. There are in fact real risks. For example, studies are starting to show a rise in body image issues among boys; and along with that, eating disorders and depression. You can see how the images of cartoon superheros with unattainably huge biceps – which are not limited to that Wolverine figure but are actually very prevalent – could influence a young boys perception of his own body. Adding to the problem, according to Ms. Smith, parents are less likely to be attuned to body image issues in sons. Emma Frost is looked up and down by Angel when she first appears in Wolverine and the X-Men. Thief Gambit notes the beauty of his client Zane on another episode of the same show. Booster Gold hits on the “beautiful” scientist he rescues in an episode of Justice League, referring to her as a “damsel in distress” and a “hot doctor.” The League is also the home of Flash, who is regularly shown making moves on women. Over on Super Hero Squad, all of the men gush over Black Widow, and Iron Man tells the evil Enchantress that “even in defeat you’re a striking woman. What’s say you and I have a little dinner. And again I ask: Who the heck writes this stuff for little boys? Who? I tend to believe it’s someone socially stunted, immature and seriously lacking in creative ideas for children. Why are they pushing this stuff on boys from a young age? This is not what little boys are interested in. And then who approves it? There must be someone along the line who actually has kids. Where is that person? It will be clear after you read this book that many, many producers of media for children are not interested in presenting healthy, positive, quality stories that will contribute to our children’s development. Crystal Smith, a passionate and smart parent, lays it on the line, and shows us just exactly how those media producers are harming our boys. Also check out The Achilles Effect website. I found your blog on BlogHer!What a great piece! I totally agree…who writes some of the junk that gets published for specific kid audiences??? Hi Christina, I'm so glad you found me. Welcome! Stereotyping is common nowadays. Various items are marketed to a specific crowd.